Home » Play » Feeling bored? Try a boardgame! Feeling bored? Try a boardgame! While reorganizing the clutter that constantly threatens to take over our little house, Charlie and I gathered up all of our boardgames so that we could store them all in one place. By the time we had collected them from the wardrobes, the sitting room and the office, we had quite an impressive collection built up. I think we were both a little shocked at just how many we have. Though when I think about it, I’m not that surprised. In a world full of distractions like television, laptops, iPhones, iPads, not to mention Facebook, Twitter, and now Pinterest, it’s all too easy to spend the entire evening sitting in the same room as each other once Little Man has gone to bed, without interacting with each other. 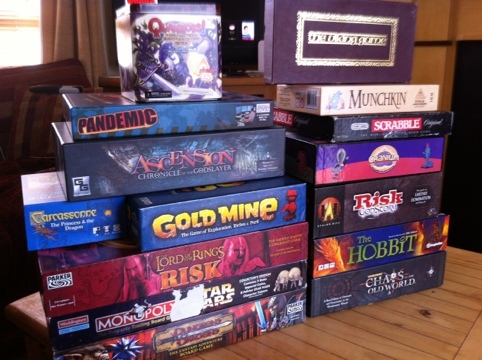 For us, boardgames have been a great shared activity that forces us to disconnect from the online world for a little while, and have some fun together. Carcassonne – the standard version of the game is still great with two players, but we prefer it with more. Risk Godstorm – we don’t often get a chance to play this because it needs a minimum of three players, and a good game can take quite a while, but it makes for a great competitive and challenging evening. Cranium – I think this is my favourite party game of all. We’ve cried laughing while playing this with friends more than once! Ticket to Ride – oddly enough we don’t own a physical version of this game. We only have it on the iPad. But we’ve played it with two players and with groups, and it’s always enjoyable. I suspect we’ll be adding the physical version of the game to our collection at some stage, but for now the iPad version does just fine!